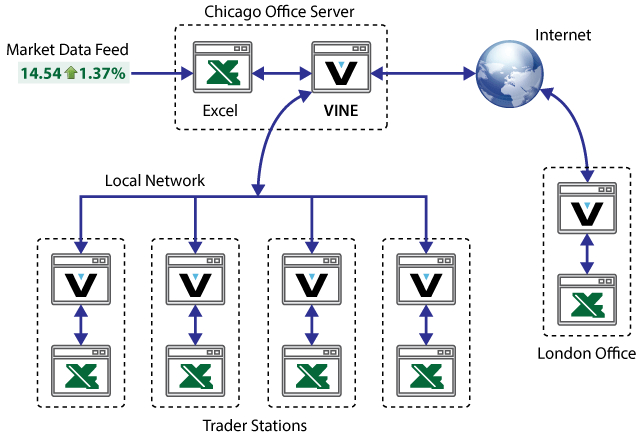 Skkynet Vine enables sharing of your real-time market analytics by instantly networking Microsoft Excel™ spreadsheets. Skkynet Vine™ connects to all your data sources such as Bloomberg, Reuters, or your custom data feeds, and delivers your analytical results to everyone that needs to see them in Microsoft Excel; in your office or across the world in a remote office, in real-time. With Vine, your Microsoft Excel derived analytical data is visible for everyone to display, manipulate, publish, or even combine with new analytical data to be further shared throughout your organization, empowering an environment of collaboration. Connection to Excel through DDE is transparent, instant and easy with Skkynet Vine. * Excel and the Excel logo are trademarks of Microsoft Corporation. At the core of Skkynet Vine is our 21 years of experience in manufacturing; enabling real-time data collection, integration, distribution, and visualization of mission-critical process control data. With our unique, non-intrusive, firewall-friendly, low bandwidth and highly scalable solution, not only do you control your data distribution, you also control your intellectual property. Since you are only sharing your analytical data, rather than sharing the Microsoft Excel spreadsheet, all your computations are secured and only the results you choose to share are distributed. Skkynet Vine can be integrated with the SkkyHub™ service so your offices do not need to invest in security solutions to share your Microsoft Excel analytical data. With SkkyHub, your firewalls remain closed, there is no need for any VPN connectivity, yet your analytical data can be shared bi-directionally through an encrypted tunnel. Each user is isolated, preventing virus propagation and cyber-attack, without compromising speed. Skkynet Vine is implemented in three easy steps, without any development, databases or software scripting required. In fact, most implementations can be configured in minutes with no impact on your existing office infrastructure or changes to your security. Reading the data out of Microsoft Excel is usually the first step in the process. This involves a simple configuration in Vine where you define which cells in your spreadsheet contain the data you are interested in. To reduce bandwidth usage and reduce latency, most customers define large ranges within Excel. Once the data is defined, it is a simple procedure to tunnel/mirror this data over to another Skkynet Vine user. Simply tell Vine on the client computer where to look on your network and it will connect to the other Vine server and immediately connect the data. Whenever new data is read into any of your Vine clients, it is immediately mirrored to all connected clients. The final step in the process is to copy the data from the client-side Vine into the client user’s Microsoft Excel spreadsheet. This is simply a question of dragging the data point from Vine and dropping it into the Excel spreadsheet. Save the sheet and the next time you open it, Excel will immediately start receiving data again.